The community of Westchester has long been a hidden gem, with only its locals knowing about the treasures that lie within. Driving down Emerson Avenue, most people might only notice schools, homes and churches, but if you look a little harder, you will find a small garden that has brought together a group of dedicated volunteers that are inviting the community to step inside the urban oasis they’ve created. Occupying an acre of land on the campus of Wright STEAM Middle School is the Emerson Avenue Community Garden (EACG). This completely volunteer run garden was years in the making; Garden Manager Dorothy Stone recounts that in the mid-1970s the plot of land was originally reserved for an agricultural program of the Los Angeles Unified School District. Over the years, however, it became a storage area for trash bins and weeds until a new vision finally took place. With the combined efforts of The Environmental Change-Makers, former Wright Middle School teacher Paula Cohen, several community members and a beautification agreement with LAUSD, January 2011 marked the official ground breaking for EACG. It was around that time that current garden president, John Sharpe, saw a feature in the HomeTown News asking for volunteers. Looking to help, he began donating gardening supplies, and it would be a few months before he attended an annual meeting and decided to become a part of the garden’s board. Now some three years later, he admits that although he is not an avid gardener, he got involved because of the community. Being attached to a middle school, 34 garden plots are reserved for students. Another 38 temporary plots measure 300-square-feet and operate on a first-come, first-served basis. 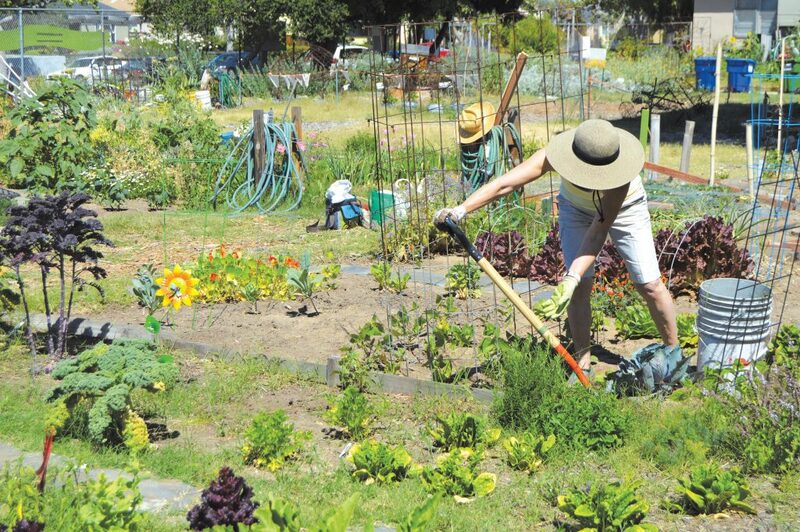 All potential plot holders can expect to pay a small fee—$10 a month—to cover gardening tools and water. Due to popular demand, the current wait list for a plot is 25 names long. There are some rules for having a plot: you must farm organically, you can’t neglect your plot, 20 volunteer hours a year are required and 90% of allotted space must be used to plant food. With a roster of more than 200 volunteers, when the garden is open after school hours and on the weekend, visitors are sure to meet fellow gardeners and community members admiring the outdoor space. Always looking to create new partnerships, EACG has worked with groups like LMU, UCLA and Girl and Boy Scout troops. Even companies like Google want to get involved and have sent groups of employees to learn about the garden and to help with beautification projects. With the environment in mind, the garden makes every effort to minimize waste and has a wonderful compost heap that gardeners can use for their plots. A favorite among children, a blue bin on the property is home to hundreds of worms to help with decomposition. Once a month, on a Wednesday afternoon, you can expect to see volunteers feeding them. May promises to be an exciting event month for EACG as they will hold their largest, yearly volunteer event at the garden in honor of “Big Sunday,” a city-wide initiative that encourages people to volunteer with nonprofits. The community is invited to participate in this family-friendly event to learn what EACG is all about, as well as get their hand’s dirty pulling weeds, painting and mulching. The volunteer day will take place on Saturday, May 7 from 9 a.m. to 1 p.m.
Later in the month, the garden will hold its inaugural “Small Plates Fundraiser” on Saturday, May 21 at 6 p.m. as a way to celebrate their volunteers and plot holders’ hard work. Produce from the garden will be worked into some of the dishes at the event. Guests will also be treated to live music. For EACG volunteers, having social events and activities that celebrate community are a vital component of the feeling they are trying to create at the garden. Westchester resident and co-chair of the garden’s Public Relations Committee, Travis Dina-Pham, says it’s always a pleasure to work with fellow volunteers. Even board meetings consist of fellowship, where people are just as eager to eat and drink with each other as they are to get through the agenda. He hopes the work being done at the garden has a positive impact on the community. “We want to raise awareness that we are a strong community and that this place is built on a volunteer-basis and is a wonderful holistic experience open to anyone,” said Dina-Pham. Sharpe hopes that 2016 will be a big year for the garden. While the EACG currently has a temporary agreement to use the space with LAUSD, he is hoping that this is the year a long-term agreement will finally be signed. This would allow the garden to raise funds to upgrade the space, make the garden’s walking paths more wheelchair accessible, so it’s ADA compliant, and level out the lawn area for future classes and events. This fall, the EACG plans to hold its inaugural WAM! (Westchester Arts and Music) Festival. WAM! aims to partner with local organizations such as Otis College of Art and Design and Loyola Marymount University to showcase art in the garden, with a festive celebration full of food and music. The EACG is on the campus of Wright STEAM Magnet, located on Emerson Ave. between 80th St. and 80th Pl. in Westchester. For more information, please visit eacgc.org. Pictured: Westchester resident and EACG member, Eva Edwards, tends to her garden plot.